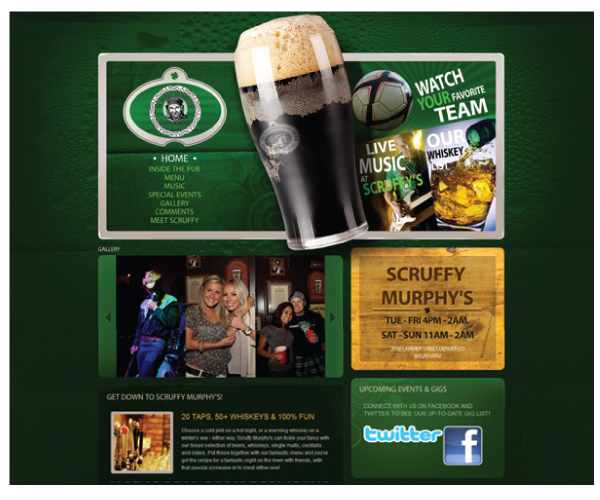 Scruffy Murphy’s is a fun, destination Irish pub in downtown Denver. Located in the heart of LoDo, near Coors Field, Scruffy’s turned to our marketing agency for an inspired advertising push. Scruffy’s main marketing goals were to highlight their large whiskey selection and to promote their interesting musical acts. We created a good mix of traditional advertising (print ads), interactive & website marketing, as well as social media (Facebook and Twitter) to create a broader web presence. Through social media optimization and marketing, we were able to further engage the customers of Scruffy’s. Scruffy’s tagline is “You may come as strangers, but you’ll leave as friends,” a theme which we stressed throughout all of their Internet marketing, with old-time graphics and pub images. As more and more people continue to turn to the Internet to find what they need (through websites and social media), it becomes increasingly important to convey strong, consistent messaging with distinctive images. We can help you boost your Internet marketing efforts, with a cost-effective, cohesive campaign that stays true to your mission and brand. Please note: In addition to Internet marketing services and social media marketing and optimization, our marketing agency in Denver, Colorado also offers: strategic planning, graphic design and copywriting, public relations, branding, event marketing, and media planning and buying.